Brothers, Billoo and Gulloo set off on their fantastical voyage to find the Jungly Jadoogar and reverse her spell that has turned their town's people into animals. On their way they discover that the evil sorceress has kidnapped Prince Jalfrezi and if rescued, all Jungly Jadoogar spells will be broken. To defeat her they must fight her big, pink dragon, Fifi. Their journey takes them through three towns. Tuna Upon Brine, where luminous fish fly to the Jungly Lair at sundown each day. Twerky, whose magnificent dancers just cannot stop dancing and Belchford, where beautiful sisters, Little and Spittle, have turned into belching and farting ogres. It is an enthralling family show. 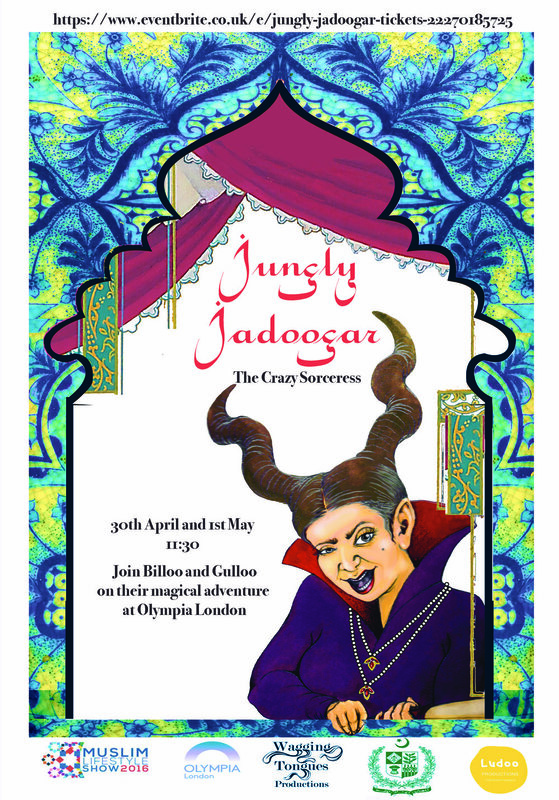 With its humour, visual effects and fast paced story line, Jungly Jadoogar provides an entertaining experience for adults and children alike. It formed part of the Muslim Lifestyle Show 2016 being held at the Olympia London on 30th April and 1st May.